More than 20 million Americans are estimated to struggle with addiction to a drug or alcohol in any given year, yet only 10 percent seek treatment for their addiction according to the National Survey on Drug Use and Health. How can we help more people get treatment for addiction? Q. Why do so few people seek treatment for a disease that is treatable? A. 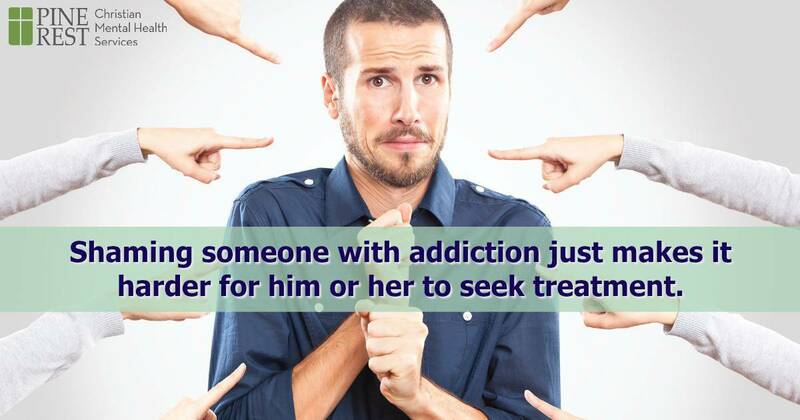 One of the major barriers that keep people with addiction or substance use disorder from seeking treatment is stigma. 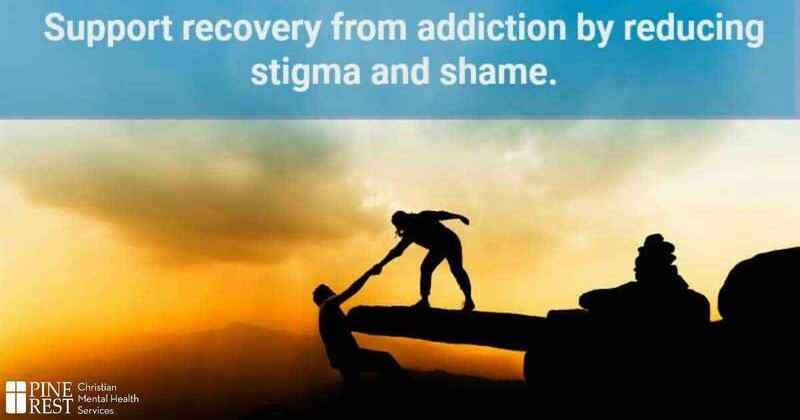 Stigma includes commonly-believed myths that “addicts” are weak-willed, lower-class, or not fit for society. When friends, family members, employers, peers and healthcare professionals hold and validate these beliefs, it creates shame for people who struggle with addiction. Even if they know they have a problem, they might try to avoid stigma and shame by resisting treatment. Q. How can I help reduce stigma and shame? Rethink how you talk about people with addiction. For example, instead of using derogatory names such as addict, junkie, abuser, user, stoner, crackhead or drunk that seeks to shame people for a moral weakness, refer to an individual as a person with an addiction, addictive disease or substance use disorder. These modifiers give identity to individuals as people with a disease, rather than labeling them by their illness. Celebrate recovery during National Recovery Month (September) and all year long. Over 23 million people in the United States are living in recovery. Chances are, you know more than one person in recovery. Q. Is addiction really a disease? A. Yes, according to the American Psychiatric Association and the American Medical Association, addiction is a brain disease that leads to a person’s inability to stop using alcohol or drugs. People who are addicted are not able to stop using – even when they know that using will lead to awful consequences (i.e. loss of marriage, family, friends, income, etc.). A. Yes, addiction is treatable with the use of a counselor, addictionologist, and community support groups. Treatment provides opportunities for people with an addiction to detox from the substance, develop coping skills for when they experience a desire for using, and learn more about the disease of addiction. When seeking a counselor for addiction, be certain the counselor has a certification for substance use which means that they have special training to understand symptoms of addiction and to guide a person toward overcoming their symptoms. An addictionologist is a medical doctor or physician’s assistant who is specially trained to identify when medication may assist with eliminating substance use. Community support groups increase support from others who are in recovery and provide social opportunities that do not include drug or alcohol use. Support groups are available to support members with varied or no religious beliefs. Most popular are 12-step programs (Alcoholics Anonymous (AA) and Narcotics Anonymous (NA)). No particular religion is endorsed; the emphasize is on importance of relying on a higher power of each individual’s choosing. SMART Recovery (Self-Management and Recovery Training) is secular and does not practice a belief in a higher power. Celebrate Recovery is a 12-step program with a focus on Christian beliefs. Evidence from studies shows that treatment outcomes improve when a person uses a combination of a counselor, addictionologist, and community support groups. Q. My friend or family member is struggling with addiction. What can I do? A. The answer to this question is complex and varies for each situation and person. With that in mind, there are a couple of options where you can go to seek some answers from professionals or others who live with people who struggle with addiction. Pine Rest’s Addiction Medicine program has a ten-week family or support person group that provides education, understanding, and support led by a professional. Also, Al-Anon Family Groups is group that exists to support friends and family members of those who struggle with addiction. Q. I think that I struggle with addiction. What is my first step? A. The great news is that identifying that you might be struggling with addiction is a first step. For most, that is the most difficult part of treatment. The next step is to seek a counselor, addictionologist, and a community support group. There will likely be at least a few days’ of wait time before you can see a counselor. While you are waiting, connect with AA or Celebrate Recovery. Seek people who are in long-term recovery and connect with them. Remember addiction is a disease and is treatable. The Addiction Medicine program at Pine Rest is here to serve as a resource for your questions regarding addiction. If we do not have the tools to help you, we will search for answers to help you. Kathy Carruthers, LMSW, CAADC is a Licensed Master of Social Work and a Certified Alcohol and Drug Counselor. She is currently attending Walden University for her Doctorate of Social Work (DSW) with a specialty in addiction. 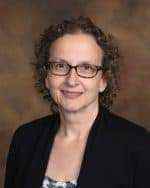 She earned her Master of Social Work (MSW) degree from Grand Valley State University.